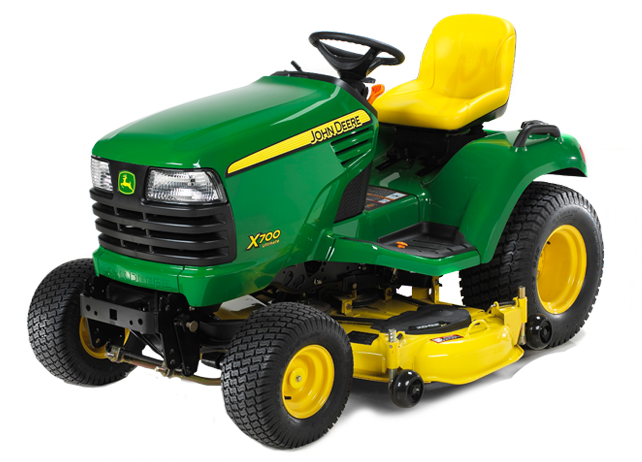 John Deere lawn mowers in the 700 series include the X700, X740 and the X748 models. These are riding lawn mowers meant for larger properties and for consumers who also may need additional attachments to complete some of the tasks on their property. These attachments include front end loaders, trailers, blades etc. There are also tillers, scrapers, blades and various hitches that will connect with these attachments such as cultivators. This series is very versatile and flexible. They pretty much provide just about everything you will need to maintain your garden and property. The following provides some additional detail on each model. X700 – includes internal hydraulic PTO with a multi disk clutch pack, heavy duty welded frame, improved maneuverability with 22 hp, 2 wheel drive, and power steering. X740 -soft, smooth clutch engagement, operates with a wide variety of equipment, an automatic transmission, a 24 hp engine, 2 wheel drive, and power steering. All of these models are suited for consumers with large properties who need versatile machines to help them complete their landscaping projects as well as maintain their properties in the manner they would like. We are not advertising these machines and we do not gain anything from the sale or purchase of these machines. We aim to help consumers decide which machine would best meet their needs. If price is an issue, then the X700 is probably the best value. It only has slightly less horse power than the other two. Features differ so make sure that you carefully consider which attachments you may want in the future. What you will be doing with your lawn mower / tractor. This is an expensive decision so take the time to think ahead. Consider what makes sense for you personal situation. 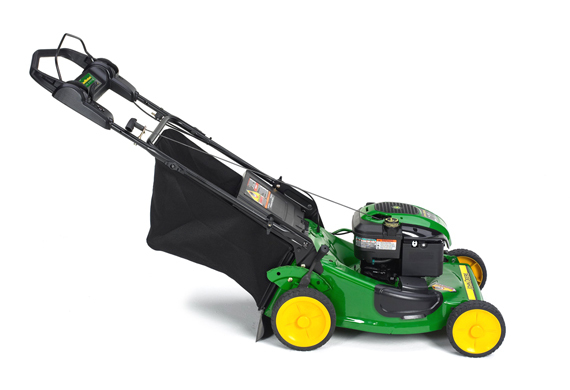 We noticed that our readers are interested in John Deer Lawn Mowers Self Propelled so we decided to do a little research on this topic to see what John Deere is currently offering in terms of lawn mowers and how a consumer would decide which lawn mower to choose from. 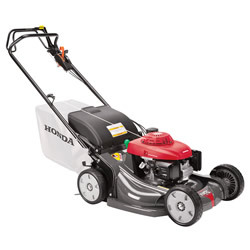 They have a pretty good web site that takes into account most consumers needs for lawn mowing. for example they have 25 consumer lawn mower models to choose from including push, self propelled, mulching, electric and manual start as well as gas and electric models. How does one choose the model best for them? Turns out it is quite easy. Just select the filters that make sense for your needs and you will have one or two machines that make the most sense for your application. In out case we have a relatively small yard that is flat. We also preferred a gasoline engine with a variable speed self propelled capability. We could have chosen an electric machine or a single speed self propelled lawn mower. Finally we wanted a mulching lawn mower. For years I collected grass clippings and put them in bags to go out into the garbage. But those days are past. We just want the grass to be cut up in very small pieces so that they will disintegrate and feed our lawn. Much less work and better for the lawn. We ended up with the R43V John Deere self propelled lawn mower. 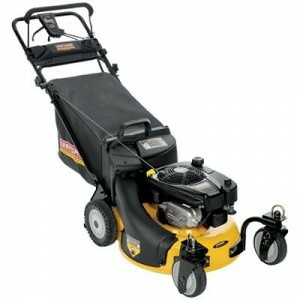 It comes with a 17 inch cutting width, variable speed from 2.5 to 4.3 km/h. 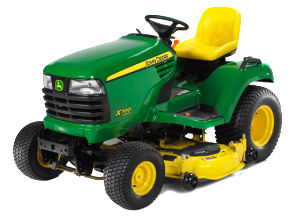 This is a really great way to help decide on what lawn mower you should choose. Of course the last factor to consider is price. Now that we know what lawn mower to purchase, we have to watch for a sale price. Perhaps near the end of the season when the stores are trying to get rid of all of their inventory. Lucky for us, our current lawn mower still works. 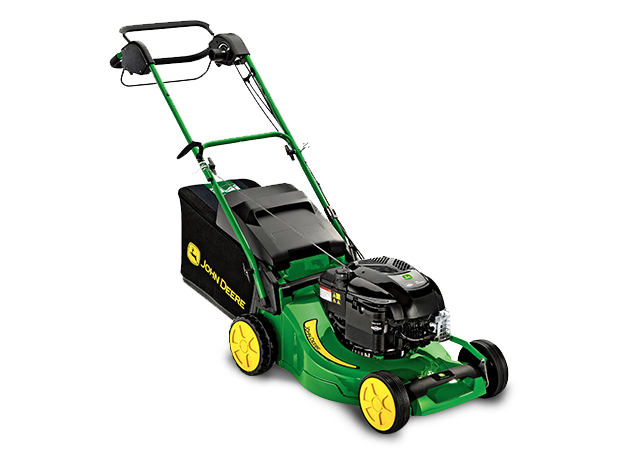 We have time to make our selection and find a John Deere self propelled lawn mower with a good price. These John Deere models have been receiving a lot of hits on our blog, so obviously there is a lot of interest in these models. Comments have ranged from fantastic to people who would never purchase another lawn mower of one of these models again. We are really trying to assist readers to help them find good reliable equipment. 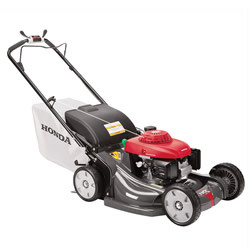 If you have one of these lawn mowers, please leave your comments and recommendations for other readers to review. Always take proper care of your lawn mower, maintain it and change the oil regularly. The engines will last for ever if you do. Our next post will continue in the objective of reviewing additions makes and models from various manufacturers. 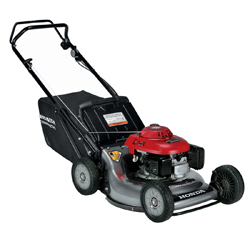 The following table compares the basic attributes of these three lawn mowers. They provide the reader with a high level view of the features of each. There are many more features and specifications which prospective buyers are interested in. However these are the main features that most consider first. Width of the cut, power of the engine, propulsion and height adjustment. This is a short review showing the specifications only for the John Deere JS26. If you would like the full review, visit the original page by clicking here. 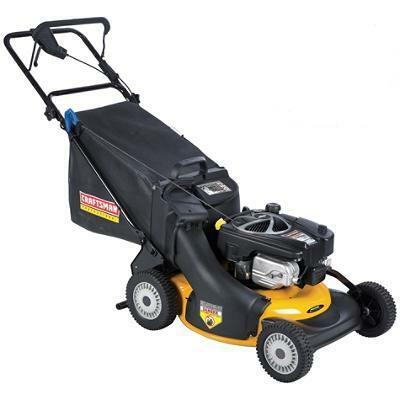 This is a 22 inch wide lawn mower machine suitable for most consumers lawns, with average size lawns. If you are mowing a large lawn and are interested in reducing the time it takes to mow your lawn, you may want to consider something wider that cuts a wider swath each time you cross the lawn. 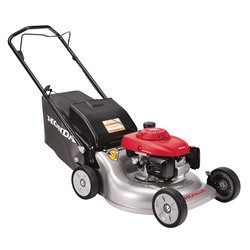 A wider lawn mower can save you a lot of time each week when you mow the lawn. This particular lawn mower has 14 comments on the main page at the time of updating this post, most of them negative with the exception of two comments. One owner loves his machine and it seems to run well for him. The other semi positive comment was from a lawn mower mechanic who ended up with this lawn mower from a customer. Turns out the lawn mower had never had the oil changed in it, there was water in the oil and it was black.The engine was overheating and no wonder it was hard to start and causing problems. Consumers should always provide the required maintenance for their lawn mowers regardless of the type that they own. The John Deere is no different. As a lawn mower review web site we urge consumers to look after their equipment. follow the owners manual instructions for changing the oil at least once a year and more often if you run the engine for long periods. If you take care of them these engines will work for many years. We are not sure if this was the problem for the other owners with the negative comments, however head off to the main site if you are interested in seeing their comments. Refer to the main review page for additional comments by other readers as well. 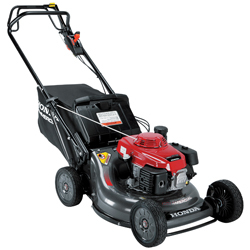 We decided to include a few comments about maintaining lawn mowers in this post. 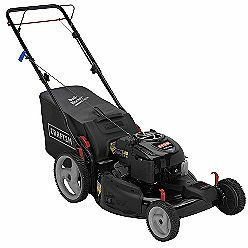 We are conditioned to changing the oil in our cars every 3000 miles, so why do we not take care of our lawn mower engines? The answer seems to be that we will take our cars into the mechanic. It is easy to do and we do not get our hands dirty. With a lawn mower even if you want to take it to a mechanic, you are going to get your hands dirty just lifting it into the car. Many people are not able to lift this kind of weight so they just don’t bother. They could change the oil themselves, however they would need the tools and would need to dispose of the oil properly. For many people it is just easier to ignore it and hope for the best. 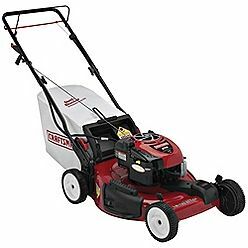 The lawn mower engine is going to get hard to start and it will begin to burn oil when it does start and will not run smoothly. Eventually it will just quit all because the oil in the engine has not been changed. That’s our theory and we are wondering if people agree or disagree with this opinion. This is a short review showing the specifications only for the John Deere JS26. If you would like the full review, visit the original page by clicking here. 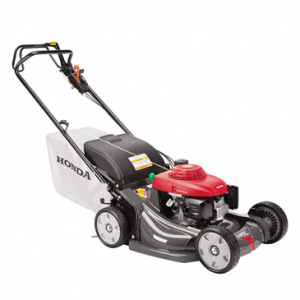 This is a 22 inch wide machine suitable for most urban lawns. Refer to the main review page for additional comments by other readers as well. This is a very nice machine with lots of features that are suitable for many consumers in urban settings. Mulch, discharge or bag your grass clippings. A similar lawn mower to this with these kinds of features is really perfect for our lawn. I used to bag all of my grass cuttings and now I wonder why I ever used a lawn mower with a bag system. With a mulch lawn mower cutting the lawn is so much easier and a lot less work. Many lawn mowers have this 3 in one option, but we have to say that mulching is by far the best configuration to use. We really like the front wheel propulsion for our lawn even though it is a level lawn. Cutting the lawn is really effortless and all you need to do to slow down or change direction is to lean slightly on the handle which lifts the front wheels off the ground. When this occurs you have less traction and the forward speed naturally slows down. You can also easily turn the lawn mower in this configuration as well. Just lean on the handle and turn the mower, let it down and away you go. We like this configuration much better than the rear wheel drive configuration for lawn mowers. We also only use the lawn mower in a mulch mode which saves a great deal of time. No longer do we need to bag the grass clippings and then put them out in the garbage. the grass clippings go right back into the lawn, so the nutrients are being added back in as well as the grass clippings protect the roots from the hot sun. The ground does not dry out as fast on those hot summer days. We also do not have to rake heavy grass clippings and then bag them to be placed into the garbage. We have a compost bin and used to place our grass clippings in the bins. They would get full and then we would have to empty them and turn then over while adding ground to the clippings to increase the natural decay of the clippings, which is a lot of hard work. No longer. It is so easy cutting the grass now with the kind of features that this lawn mower has such as the mulching blade. We also do not have those stinky garbage bags full of grass clippings that are slowly rotting while we wait for garbage day. Our garbage is only picked up every two weeks! You can imagine what condition those grass clippings would be in at the end of two weeks. 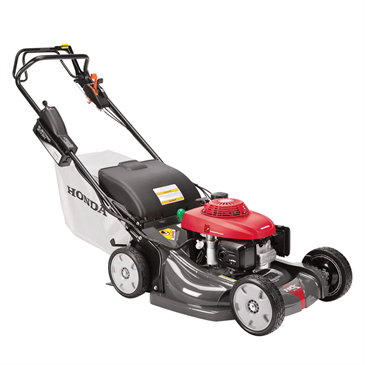 Check out our main page for this lawn mower for more information and comments from a variety of readers.